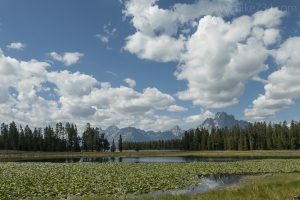 This lily pad covered pond, frequented by waterfowl, looks out to Half Moon Bay with a lovely backdrop of the Grand Tetons. The hike starts on the Hermitage Point Trail along the south end of the Colter Bay Marina. It travels on a dirt road with a view of the marina, filtered by lodgepole pines, then further out Colter Bay to Jackson Lake. At the junction with the Swan Lake Trail, continue straight, entering into a lodgepole pine forest. Stay on the original trail, avoiding the side trail, for a shorter and more pleasant route to the pond. After the point where the two trails merge, the trail continues along the east side of the lily pad covered pond. 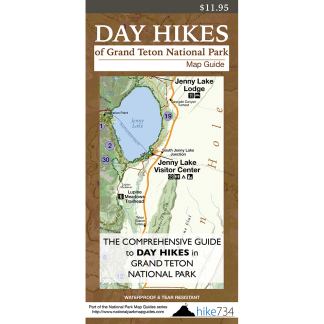 It reaches a nice spot overlooking the pond, portions of Half Moon Bay, and out to Jackson Lake and the Tetons.